Ben went to US for shopping again. This time he was looking for the Canon S100 camera. He thought it would be cheaper in US. However, both Best Buys in Bellingham and Burlington ran out of stock that day. It is a popular new toy. When it’s time for lunch, Nanzaro insisted to have buffet which both Ben and I were reluctant to. Buffet seems to be the by gone days for us. We came across a banner of a new buffet grand opening on Meridian Street. So, for Nanzaro’s sake, we went to check it out. 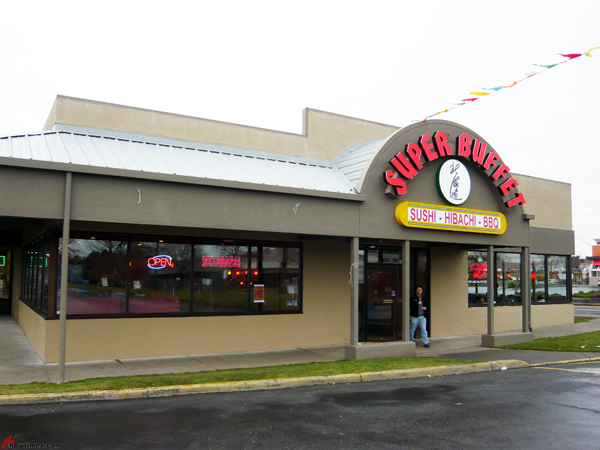 Apparently, this new Super Buffet took over a previous Asian buffet restaurant that we had been before. Weekend prices are not cheap. 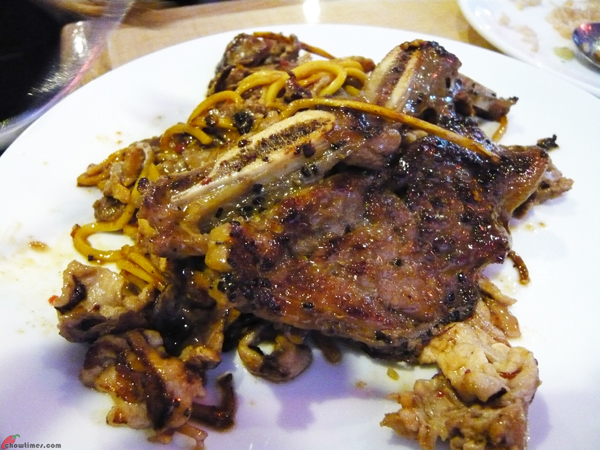 It is $13.99 all day; which is also the weekday dinner price. Lunch on weekday is cheaper at $8.99. 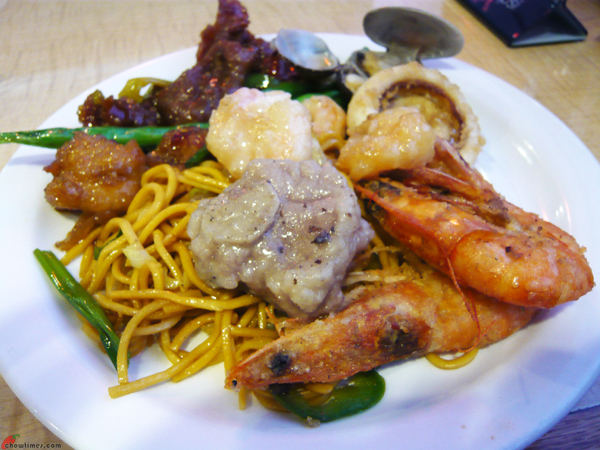 There were quite a lot of items to choose from; from sushi to Chinese dishes, cold seafood, salad, dessert, etc. The above was my first plate. 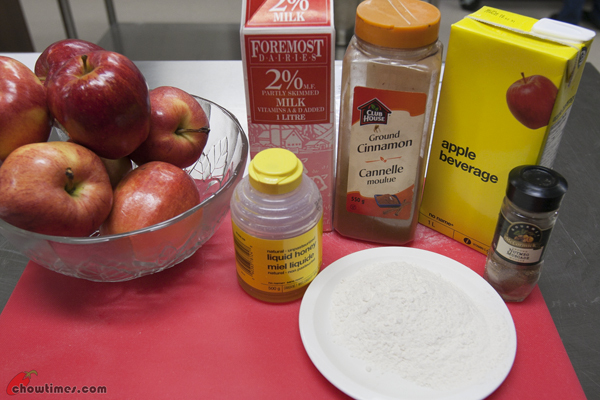 For dessert, Minoo prepared a Stewed Apples for the South Arm Community Kitchen. 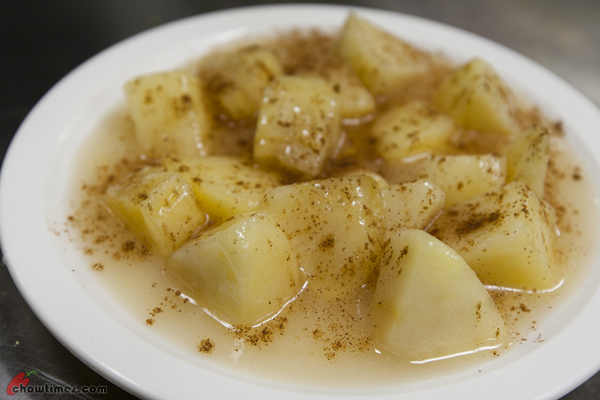 The Stewed Apple if topped with vanilla ice-cream will make an exquisite dessert. 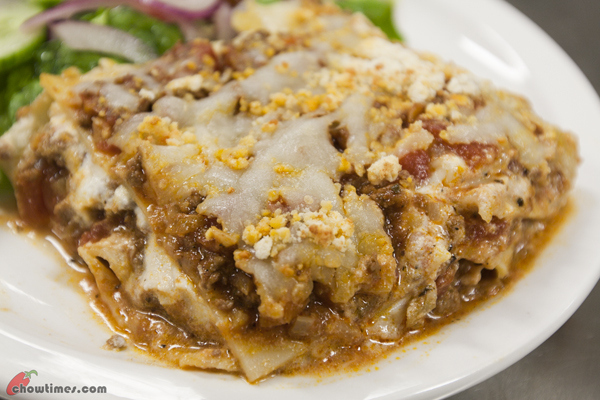 Minoo complements the Classic Lasagna with a simple Mixed Green Salad. 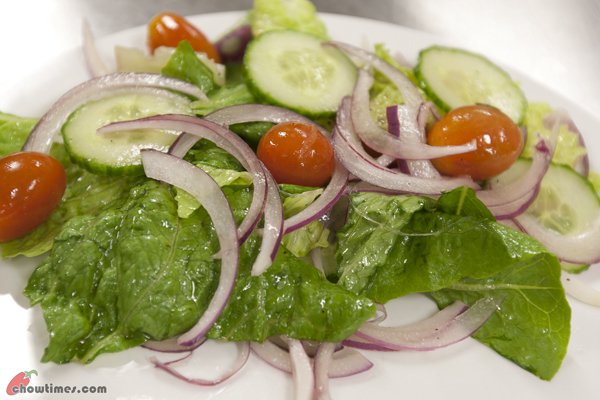 The Mixed Green Salad is dressed with olive oil and red wine vinegar. I would add a touch of honey to cut the acidity of the vinegar. 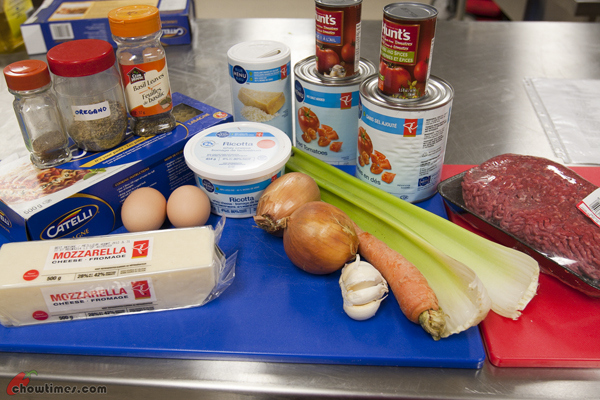 The main course for the South Arm Community Kitchen is a Classic Lasagna. Lasagna noodle is a wide and flat type of pasta. Kids will love this cheesy Classic Lasagna. It is great for pot luck. 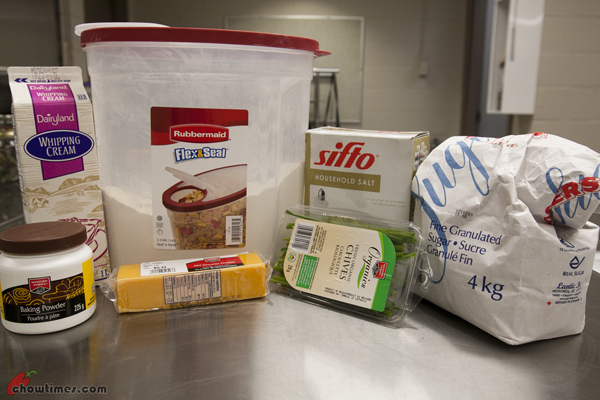 Minoo prepared four recipes for the South Arm Community Kitchen for this meet. We started with a simple, colourful, lively and warming soup. 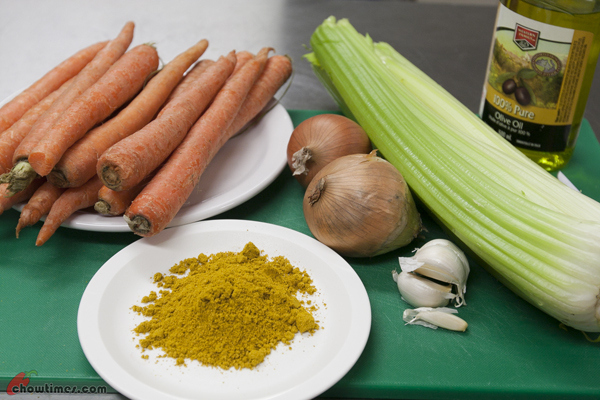 The simple carrot and celery is spiced up with curry powder. 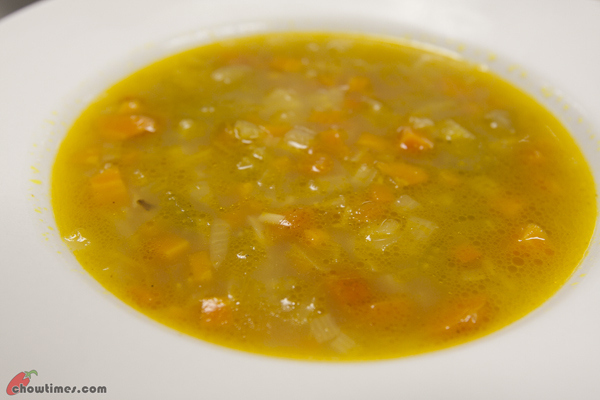 You can add any leftover food like ham or roasted chicken shreds into the soup to make it more appealing to kids. The addition of potatoes or grains will make it more creamy and hearty. It’s ladies’ meet again with Polly. We did not have a plan of where to go. 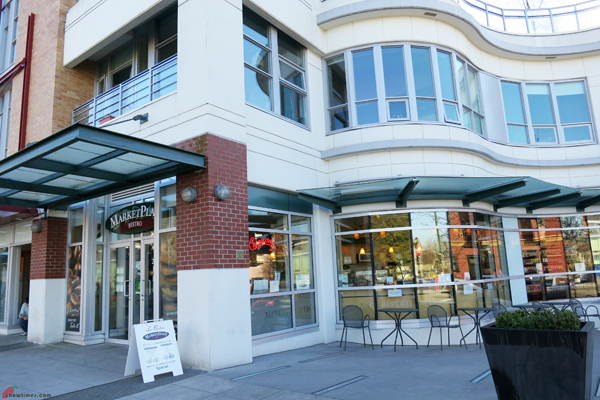 We just drove along west Broadway to look for a place to hang out because we remembered seeing a lot of places that we can go during our way back on our previous cake meet . But now that we want to look out for a place, we just can’t find one. We drove all the way to Vine St. before we found a place to go to. At first we wanted to go to Higher Ground Coffee House across Vine St but it was packed and a glance inside, I did not see much choice of baked goods. So, we went inside the Marketplace IGA bistro to have a peek. Street parking is available at $1 per hour. Marketplace IGA Bistro was not as busy and there are lots of food to choose from. Among them are baked goods, panini, bread, wraps, etc. 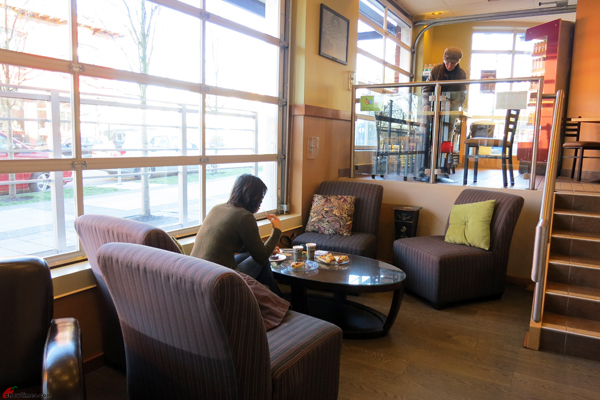 We found a cozy corner around the corner from the counter which is slightly sunken with just a few steps of staircase. We love the cozy spot. 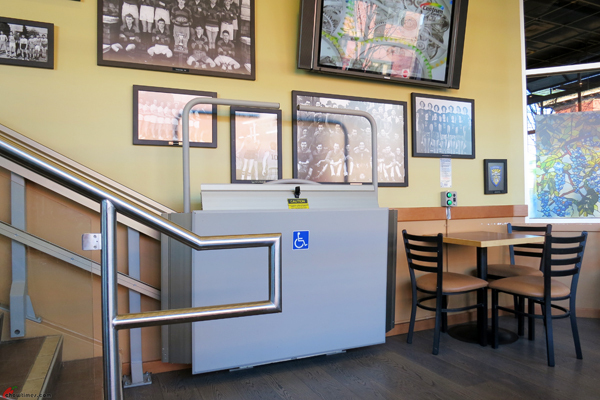 We were impressed by the fact that IGA even install a ram for the disabled to use this area. Good community service. 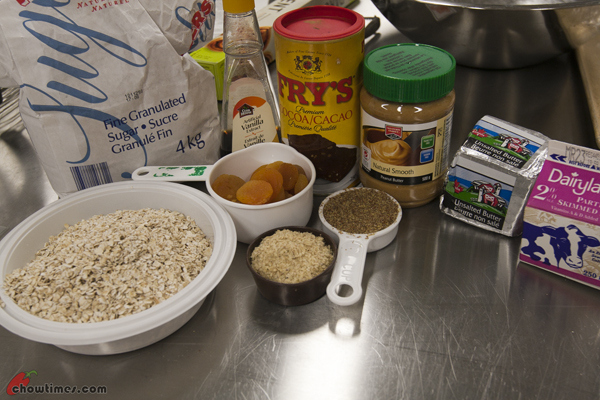 The second dessert prepared by Michelle in the South Arm Seniors Kitchen is a No Bake Cookie. 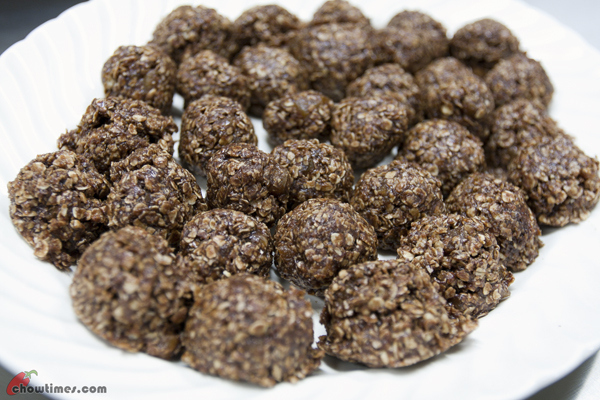 These No Bake Cookies freeze well. It is a healthy snack for your kids’ lunch box. You can substitute the peanut butter with sunflower seed butter if your kids’ school is a peanut free zone which most schools are. 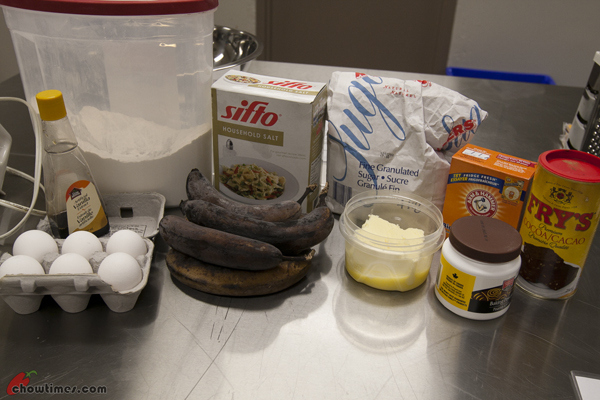 Michelle shared a banana cake recipe for dessert at the South Arm Seniors Kitchen. In fact, we had two desserts for this kitchen. We enjoyed the double desserts from Michelle’s cravings for sweets during her last leg of pregnancies. The recipe is inspired by Stella’s contributions of frozen bananas from her freezer. Michelle told us that the best way to freeze unused ripen banana is as it is. Do not store them in ziplock bag or they’ll become soggy. 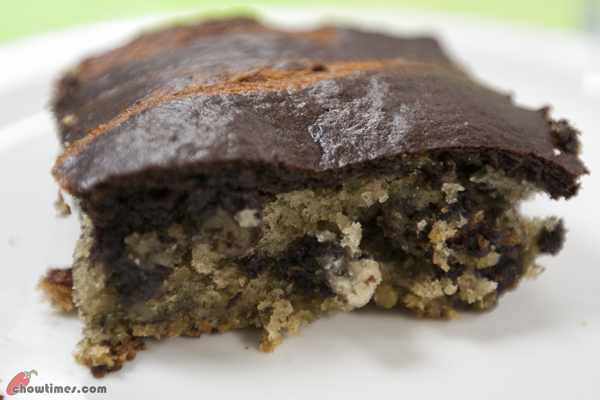 This Black Bottom Banana Cake Squares are very moist. The cocoa adds the chocolate flavour without adding extra sweetness. Instead of crusty bread, Michelle served the Creamy Kale and Vegetable Soup with Cheddar Chive Scones. It is just a perfect marriage, creamy soup with cheese scone. 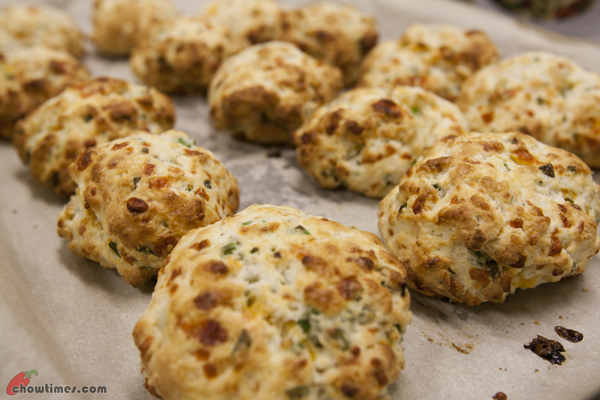 This is a scone recipe that does not have tons of butter. 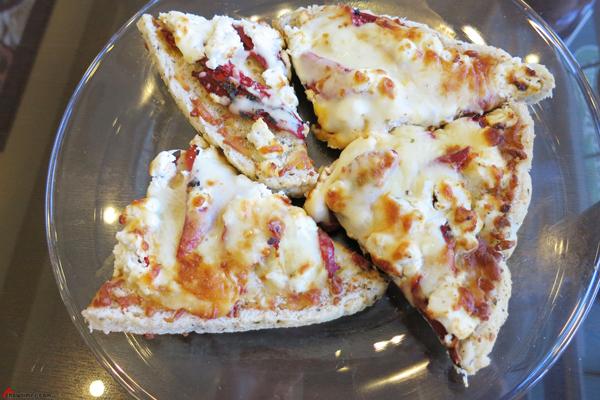 The fat comes from the cheese and heavy cream. 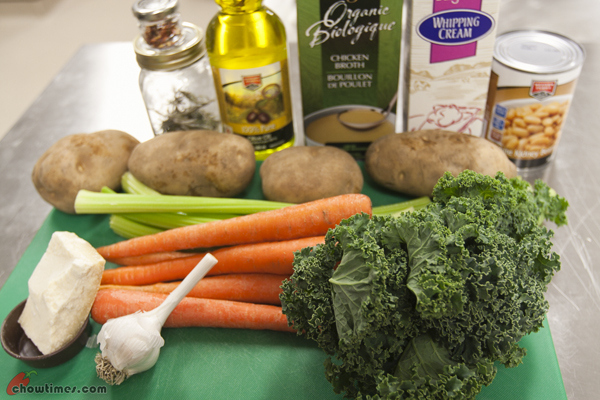 Michelle prepared a Creamy Kale and Vegetable Soup for the South Arm Seniors’ Kitchen in line with the cruciferous theme. Kale belongs to the cabbage family. Moreover, the kale is harvested from the Seniors’ Community Garden. 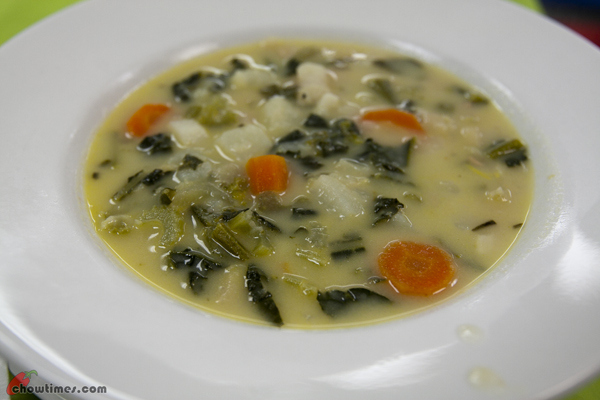 The Creamy Kale and Vegetable Soup is best served with some nice crusty bread. 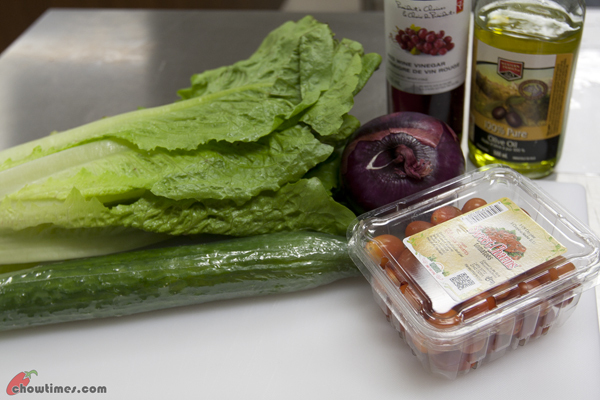 If you like Italian sausage, you can slice it and include it when your are sauteeing the veggies. Or, use farmer sausage but leave out the rosemary.